Jeremy M. Goldberg is a national leader in municipal civic innovation and public-private partnerships. He is the Director of Civic Innovation, at Civic Consulting USA where he oversees a collaboration with the White House Stronger Cities Stronger Communities (SC2) National Resource Network to create local resource networks in multiple U.S. cities. We are all “makers.” We dream. We tinker. We design. We develop. We trouble-shoot and we deploy. Across industry — public, private or government – we’re all making something; we’re all part of the maker movement. I participated in a recent panel at Governing’s Performance and Innovation Summit in Louisville with leaders from Living Cities, Philadelphia’s Office of New Urban Mechanics and the Louisville Mayor’s Office. It struck me that there are also civic makers, who are tinkering with our neighborhoods, our communities, and the things that make our cities exciting. Throughout the panel, we returned to more and more examples of technology and tools that further democratize civic engagement. And it’s not just San Francisco, Chicago and New York. We found examples everywhere of makers energizing the social and economic fabric of our cities. And the question we grappled with as a panel was how partners and those from within the maker movement can lead to lasting social impact. Louisville, the wonderful host of the conference and the birthplace of The Slugger, is a veritable glimpse of the maker movement’s history. The legendary baseball bat began humbly when Bud Hellerich saw a player break his bat during a game over one hundred years ago. After the game, Bud took the player to his father’s woodworking shop where they designed a new bat together. Bud was enthusiastic, his father was impressed and he stepped aside to encourage his son’s ‘making’. Word quickly traveled: Players came by the dozens to the family’s wood shop. 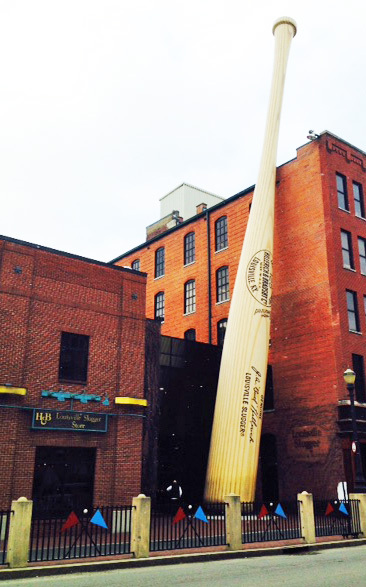 The likes of Honus Wagner, Babe Ruth, and the World Series Champion SF Giants have all used Louisville Sluggers. Today, the factory produces nearly two million bats annually. A walk through the factory is a walkthrough the history of innovation of our great nation – the company’s traditional bat-making methods now enhanced by a one-of-a-kind computer that produced consistency from every order. The new technology emerged from an iterative process which tested, tried, and developed each successive produce – that’s the maker process. Louisville also offers great examples of the civic maker movement today. When Mayor Greg Fisher hosted a conference a few years back on the maker movement, his idea was that government should be supportive of innovation and encourage entrepreneurs. At the same time the government, understandably, will not lead the innovation. Ted Smith, Louisville’s Chief Innovation Officer, shared a little insight with me as to how Louisville added the “civic” into the makers’ movement. It started when GE opened its doors to makers and entrepreneurs in 2013. As a result, community members and government staff came to the table too. This was an unprecedented moment signaling new ways for corporate and community to work together to spur new products, grow the local talent pool and encourage more public-private cooperation. With cross-sector partners at the table – government, corporate, academe, and community – the effort set in motion a wave of activity which according to Smith “culminated in a GE joint venture with Local motors – called FirstBuild” – located at the University of Louisville-Belknap Campus. In addition to the efforts the city leadership supported, the nonprofit WaterStep organized Hack2O, a Water Solutions hackathon to innovate clean water solutions in global communities. So what can cities learn from Louisville? One, leaders need to create a safe place for people to test and try new ideas, sometimes fail. Bud needed his father’s permission to craft, develop and test out different baseball bats. FirstBuild came from Mayor Fisher, GE, and other leaders letting the makers see where their innovations took them as they worked across sectors in new ways. Secondly, the big, game-changing things we are pursuing take partnerships. Without the baseball player in the workshop with him, Bud wouldn’t have gotten the Slugger right. Similarly, GE needed to bring community members in before the idea for FirstBuild came out.